I have another interview connected to the Judge Minty fan film by Steve Sterlacchini. Based on the world of Judge Dredd from the British anthology comic 2000AD published by Rebellion. You can read my earlier spoiler free review or spoiler light review and at the end of this article are links to other interviews related to this film. The film was released on You Tube during the early hours of Monday 6th May after six months of touring Film Festivals and Comic Cons throughout Britain, Europe and USA. Today I bring you an interview with Daniel Carey-George, Prop and Costume Creator. Dan’s work on this film went on to him forming Planet Replicas. Semple: How did you become involved in this project? 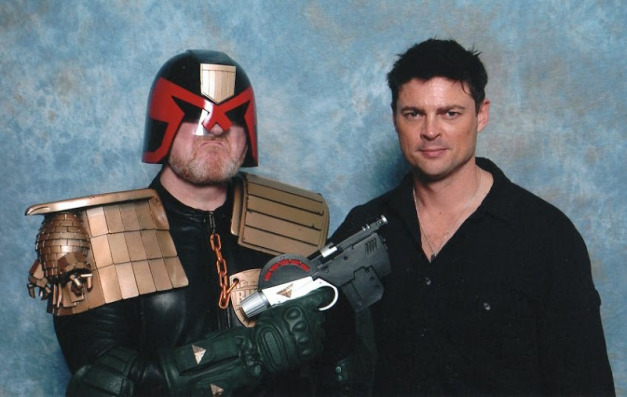 Dan: Me and Steve discovered our love of Dredd via a Vintage Porsche website, we both liked the idea of doing some sort of live action Dredd, this was way back, and before any news of the 2012 production. I always made prop replicas for fun so it seemed logical to try to put them to use, I was showing my work at an event when Steve G showed me his digital work – actually it was his Aliens APC animation that I really loved- and from then the project seemed not so much a cool idea but a very viable project for us. Semple: Where you a fan of Dredd before this? Dan: Oooh yes. I guess Star Wars was the film that started the fire but 2000AD was the regular dose of greatness that kept it burning. Semple: You created the Judge Uniforms and all the props for the film, do you know how many individual items that would be? Semple: Did you design the uniform with an eye on the version as drawn by any artist in particular? Dan: Truthfully I did it from memory – my favourite artists were Dillon, McMahon and Bolland, I didn’t really use reference as I just made it up as I went, using a mental picture. I just tried to not make it too sculptural, as that makes it look too ‘frilly’. Semple: The Lawgiver MkII does draw a little criticism from some fans as it wasn’t in use at the time of this stoty (frankly I didn’t mind either way) was there a reason you went for the MkII over the MkI? Dan: I dont think it was a decision we struggled over, the MkII was basically already made and good to go, nothing more than that ! Semple: Again, was there a specific artist’s version that you went for? Semple:And as for fan feedback, how has that been? Dan: Amazing, for all of us. Sometimes I know we are preaching to the converted, but the internet is a very harsh place to show off something that can be easily ridiculed and shot down, but so far I have only read praise which shows just how much of an effort everyone put in to it. Steve Green’s work especially – the digital work and solid hours he did on the film was a benchmark for anyone to reach, it looks as good as it does purely because of his camera work AND digital work, period. Semple: Which character in the film, other than the Judges, are you particularly pleased with? Semple: Are there any rejected mutant costumes? Dan: No that I recall. Steve G did some costume tests wearing one of the helmets and a load of rags and a trench coat, which looked great but wasn’t replicated on the day, partly as the helmet lining was not usable so it was a bit dangerous ! Semple:Were there any costume calamities along the way? Dan: Not really – just a lot of sweaty leather ! Semple: From this film came the 2000AD license deal and Planet Replicas. How did that come about? Dan: Well, I always wanted to do something official/with permissions for 2000 AD. I did some work off the cuff for a previous Licensee which never saw the light of day, but meant I was able to meet the guys at Rebellion, who liked my work. Semple: Senior Street Judge Burdis gets everywhere, how much responsibility do you have for that? Was the world ready for Senior Street Judge Burdis? Dan: Hah, John is totally his own Boss. He does wear it VERY well and has my full gratitude for doing so. I certainly haven’t the self-confidence to be wearing the uniform myself, so its great he has the right attitude and look. Semple: Will there be helmets or badges for other Judges around the world coming from Planet Replicas? Dan: Never say never. With the movie costumes and helmets up on Ebay, and the many copies of that work that followed, the market is getting a little saturated so we are having to second guess a few options which, before the auction, were no-brainers. Its pretty sad but we are adapting fast and hopefully will be improving every aspect of what we do in order to get product out there that is desirable to all fans and at realistic prices. On a personal note I am a great fan of Hondo-Cit judges , especially when drawn by Frank Quietly. Semple: Planet Replicas have done a Gunnar Bio Chip, I have one, any chances Gunnar himself will be on sale? Semple: What other 2000AD characters can we expect to see arms or costumes of coming from Planet Replicas in the coming years? Dan: Strontium Dog deserves some love, as does Rogue. Death too. I’d like to do a Slaine piece for his 30th, and we have yet to look into the ‘full size Busts’ option of our license- I have a plan for this, but best not mention it yet ! Semple: Outside 2000AD are there any other liceses you can tell us about? Dan: Yes, but I don’t want to tempt fate at the moment ! Semple: You met with DNA to discuss costumes for the Dredd film, they went a different direction to Judge Minty. How did the meeting come about? Dan: Well, while at Rebellion the DNA project was announced, so I asked Jason Kingsley to basically show them my work. He said he would, I left it at that, knowing that these things are rarely ever looked into. Anyway, about a month later I got an email from DNA asking me to drop in with a costume to show the production team – pretty mind blowing really. If I had a second chance I would have had my business head on and had more self confidence. They already knew at this stage the direction they were going though- I think they were just interested by the shade of green I’d used, for instance, helmet visibility etc. Dan: Would the Minty team do a TV series? Well I cant speak for Steve S and Steve G, but I would certainly hope that, for us, if Judge Minty can be seen as a pilot for a series, then if it was with a paid wage at commercial rates, who wouldn’t say yes ? Certainly the bulk of the praise references it as being a viable option for TV, so if a Production Company are paying attention – its got to be more promising than yet another reality show ? Semple: I’d love to see that! Many thanks to Dan for taking time to answer my questions. This entry was posted in Reviews and tagged 2000AD, Judge Dredd, Judge Minty.